Though you won’t know it till the end, all of Man With A Movie Camera is contained in its first big scene, set in a movie theatre. The stagehands are busy, but the theatre itself is motionless until its hinged seats begin moving downward on their own; empty, until an anonymous crowd files in; passive, until its screen comes to life. We settle in to watch this crowd settle in to watch their film, and their film, it turns out, is the one we’re watching, too. ‘What is an audience?’ we seem to be asked. But that’s not quite it. The real question is ‘what is a story?’ And the answer is ‘something we watch,’ because only by viewing Man With A Movie Camera can you make any message or narrative out of it at all. This would seem true of any film, except that most films have scripts, and if you read those scripts, you’d still get the film’s plot, if not its artistry. Man With A Movie Camera has no script, and if it did, it wouldn’t make sense. Any story the film does make comes from You. You: watcher of a succession of shots of daily urban life in the USSR, connected by nothing more than their placement before and after other shots of daily urban life in the USSR. You see a woman stirring in her bed, then shots of a moving car and pigeons alighting on a stoop; then the same woman rubbing her face. You wonder how the car will affect her. Before long, you realize it doesn’t affect her at all. Not because you see her unaffected, but because you never see her again. You’ve been had, but it’s your own fault for bowing to the rhythm of the scenes, one then the next then the next; letting it make you wonder what images mean. Man With A Movie Camera seems full of these false starts—a sort of brain-contained coitus-interruptus, but only so long as you keep trying to string its pieces together. I gave up (as I should have) pretty quickly. Director Dziga Vertov and his editor-wife, Yelizaveta Svilova, wanted me to. This is what I believe. For them, and eventually for me, Man With A Movie Camera was an academic exercise, and if I allowed myself to forget that this movie—like all movies—is a succession of shots, and just became engrossed in some story I found in it, then everyone—Dziga, Yelizaveta, Chris Edwards, and You—would get an ‘F.’ I got ‘F’s’ in math, but I will by-god NEVER get an ‘F’ in movie-watching. But are we not, finally, mere Men/Women? And is it not contrary to human nature to ignore connections, even if they aren’t, really, there? Maybe I am weak. I’m a C-minus. After a little bit, after giving up the search for narrative, I found myself searching for themes! I made discoveries, too, though they were tough to sustain, and came with great effort, like a burst of kicking that gets your head above water for just a second. I saw a Marxist theme, for example. I saw it in the juxtaposition between shots of labourers at a factory and bourgeoisie at a salon—between a woman worker’s face covered in industrial grime and a woman’s eyebrows being blackened; between a cuticle cutting and an axe-grinding—the pretty, precise thing made level with the gross, heavy, but useful thing. 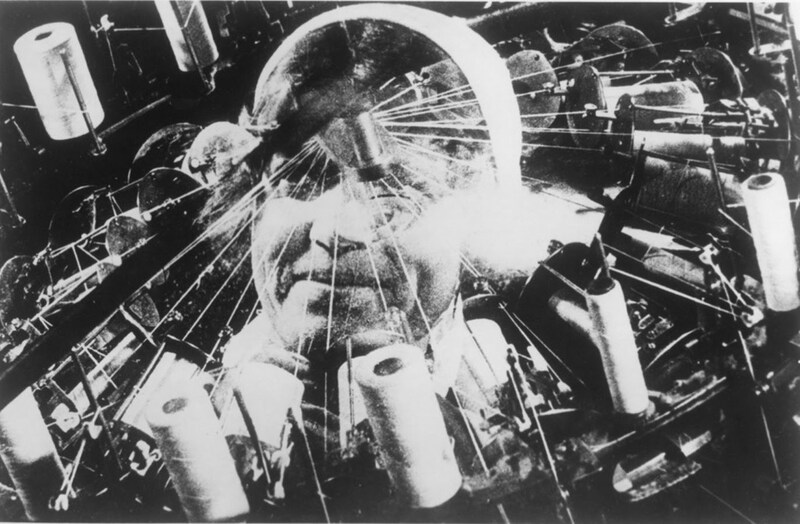 I saw Marxism, too, in the way Man With A Movie Camera gives time to images of industry, and how, by robbing us of peoples’ identities, it makes us define them in terms of the work they do. Of course, I knew Vertov was a communist before I watched the film. I also assumed—before I watched the film—that a movie made in Russia in 1928 could not be openly subversive. For these reasons, I assume Man With A Movie Camera has to be communist, but maybe it implies no such thing. 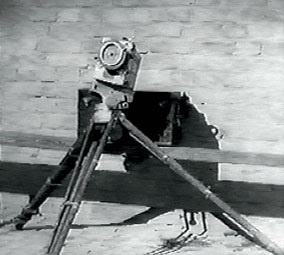 Besides, most of the industrial images come in the first half of the film. The second half is all Russians at play—their work days ended—or so I assume, since the nature of the shots change, but no further explanation is provided. We see Russians at the beach, Russians throwing discs, Russians racing bicycles, riding carousels, drinking beer. We see soccer. This could have been about the glory of the body, or the virility of the Soviet people, but to be sure one must feel a scene and I, now, can only witness its content. And so instead of following the drama of the soccer match, I just observe the cuts from the strikers kicking to the goalie stopping the ball, and remember that the ‘game’ is just a selection of non-linear shots. I’ve made them a game, but who knows if the kick and stop even happened on the same day? This doesn’t sound fun does it? Man With A Movie Camera isn’t entertaining, this is true; but it makes you think. It makes you think about how your eyes are tools for interpreting what you see, but the lazy brain tends to squander and abridge their data and submit instead to the romance of a good story. Case in point: a piece of machinery (a god-knows-what); shaped like and moving like the wheel and piston of a steam-driven train, around and around, with perfect functionality. Suddenly the lens begins to shake, and the image with it, and for a moment we think the pistons are breaking up. Another case: a camera-on-tripod, spinning, kneeling and walking away like a giant bug, thanks to stop-motion animation, which is just a succession of shots the camera (but not THAT camera) took one after the next, and now replays for us as though to show a moving creature. Are you fooled? It’s Just a Succession of Stills. Vertov wasn’t just a filmmaker, he was a musician and poet. That makes sense, since in both music and poetry, the relationship between pieces—the notes or words—receives great attention. These arts make wholes, as all arts do, but we’re not meant to forget how. As for me, I found my own poetry in Man With A Movie Camera; from it, I composed this review. While I was still watching the film. Vertov might have been pleased by this, or not. I don’t know what went through that man’s mind. 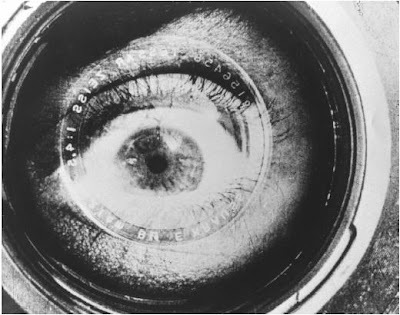 Kino International distributes Man With A Movie Camera on DVD. However, I had the pleasure of seeing this film live, as part of the Toronto Silent Film Festival. Many thanks to Shirley Hughes and her colleagues for organizing this event, and to the Toronto Film Society for its support. Man With A Movie Camera was brought to life this night by the suitably-cacophonous-jazz-stylings of AstroGroove. Though the accompaniment was at times too loud for the space, props to musicians for playing non-keyboard instruments—especially the saxophone, for more than an hour. I enjoyed reading your interesting comments on this film, one of my favorites. Unlike you, I do find it to be entertaining, though—highly entertaining, but the mystery is—I'm not sure why. :-) Taken at face value, it shouldn't necessarily be so. But I think that's the genius of the makers. A lot of my enjoyment of this film is the wonderful score by the Alloy Orchestra on the dvd version I have. It's an unquestionably important film. Even if I didn't think so, Sight & Sound still would.